Hello everyone, my name is Jackie Kunkel and I have been quilting for about 17 years and really love every aspect of it. From the fabric shopping right down to the binding! I started because my husband encouraged me to get a hobby. The first class I took, I was a little put off. The teacher made us use cardboard templates and scissors, yet I knew that there was this new invention called a rotary cutter! She wouldn’t allow us to use it, she was very old school. So I ended up taking another class. I was able to use the rotary cutter and loved every second of making my first quilt. It was a Quilt in A Day pattern, called Star Log Cabin. I gave my first quilt away to a dear friend. She now has it and continues to use it to this day. Well, quickly my “hobby” became a passion. I was quilting everyday, and just couldn’t get enough. I missed it when I wasn’t quilting. I then came home one day and said to my hubby, guess what we are buying??? A long arm quilting machine!! He said, “What is that and what will you do with it?” I told him he was silly, and that people would love to have their quilts quilted faster than they could get them done and spend more time piecing. He thought I wouldn’t have enough business, because his sister and I were the only quilters he knew. Silly again! That was the day that my business, Canton Village Quilt Works was born! 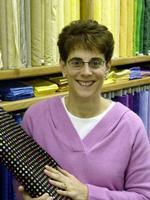 I started machine quilting as a business in the year 2000 and have been doing it ever since. I have taken classes from some of the top teachers in the country like Linda Taylor and Anita Schackelford to name a few. I continue to attend shows and classes to gain new experiences and to help me thrive in the industry. I eventually upgraded my Gammill to a Statler Stitcher model and love it! That move made me decide to become a Dealer Sales Representative for Gammill. I also recently added an AccuQuilt to my studio and offer that as a service as well. Clearly my husband did not know that there were more than two quilters in this world. I have won several ribbons for my work. I enjoy creating quilts and working on customer quilts on a daily basis. My customers have also won ribbons for their quilts. I plan on continue to enter shows, but only at my own pace. I started blogging about 1 1/2 years ago. You can find me here at www.cvquiltworks.blogspot.com. I have enjoyed blogging and have made many new quilting friends online. It really is a fantastic way to network with others who enjoy the same thing as you. I find it very inspirational and motivating. I also started the Black and White Quilt Challenge Project. I would like to show you three pictures. One is of a very early work. It is the Card Trick pattern, again by Quilt in A Day. This was made for my mom and had very little quilting on it as I did not own my long arm yet and only did stitch in the ditch. The next two photos are of current works. The black and white is just a top, but will be quilted soon. The Mod quilt was made for a friend’s daughter and is shown on her bed. I would love to hear from all of you so pop on over to one of my sites and say hello! Looking forward to meeting you. Happy Quilting to all of you! I’m Jackie’s sister-in-law, and I’m still addicted to quilting as well, and I have lots of quilting friends. I think that quilting is one of the few growing businesses these days.